As any regular reader of Digireado will know, it’s an exciting time to be an author. Yet, as the ranks of independent authors rapidly grow, very few self-publishers are bothering with brick and mortar bookshops anymore. 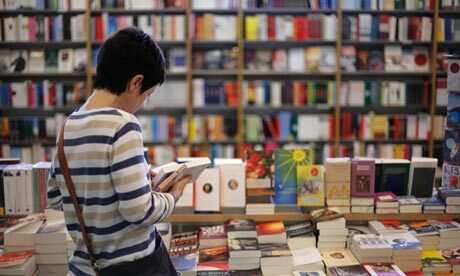 It’s not difficult to see why—sales and distribution into bookstores has always been a notoriously difficult and costly task, while the closures of large chains and cherished independents alike have led to widespread speculation that high street bookselling is obsolete. Compare this to explosive growth in online self-publishing services, such as CreateSpace, Smashwords, Lulu and PressBooks, who not only offer affordable publishing options but also guarantee that your book will be available globally in eBook and print formats. This is made possible because the eBook and POD distribution process is now almost entirely automated through a highly sophisticated global exchange of standardised book metadata. While this system technically allows any book to be available to thousands of bricks and mortar bookstores around the world, in reality sales are overwhelmingly restricted to an online retail market dominated by Amazon.com. So, while a recent Bowker report found that the number of self-published books being produced almost tripled between 2006 and 2011, the infrastructure is controlled by a handful of large companies. With more and more self-published books competing for the increasingly coveted and contested Amazon best seller lists, indie authors are realising that there is a big difference between being “available” and being “discoverable” in a crowded marketplace. The majority of self-published authors find it easiest to focus their book promotion and sales through Amazon and perhaps a small number of other online stores, reasoning that this provides the best ROI (Return on Investment) with their limited time and resources. However, authors need to be wary of simply replacing the old publishing monopolies with a new online retail monopoly. There is no doubt that online retail is an extremely powerful tool, but according to the 2012 Bookstats Report by the Book Industry Study Group, it still only accounts for 18.5% of total book sales, while bricks and mortar stores are still by far the most dominant sales channel. Despite the obvious power shift, bookstores will remain important for many years to come and by ignoring bricks and mortar stores or relying on POD (Print on Demand) listings to make your book available, self-published authors are dramatically restricting their own market. Booksellers still need to be sold to directly, which is why automated POD listings from Author Solutions and the like have no impact in bookshops. However, effective distribution into brick & mortar bookstores is simply too expensive and time consuming for self-publishers to manage successfully on their own. This is why publisher of all sizes in Australia still use specialist book distributors. Many of the distributors only deal with large publishers but there are a handful that will accept submissions from self-published authors, although they tend to be very selective about the titles and publishers they partner with due to limitations on list size, quality control and genre specialisations. What does a Book Distributor do? A good distributor will provide sales support into all the major independent and chain bookstores, online retailers, libraries and book wholesalers, as well as niche stores, gift shops and other special accounts. They will manage logistical issues such as freight, purchase orders, returns and customer accounts, and they will do it far more cost effectively than any individual publisher or author could be able. Beyond these basic services, book distributors also add value in more subtle but extremely important ways. Like major publishing houses, book distributors build their brand and reputation with their bookseller customers through the quality of their catalogue. This means that a book’s inclusion within a distributor’s catalogue conveys a certain commercial standard of quality to the bookseller that is difficult for self-publisher to obtain on their own. Your distributor’s reputation is not only crucial for direct sales but can also enhance the value of your book’s metadata in industry databases and in online retailer algorithms. For example, among the most important fields booksellers look for is the local supplier and the stock status (in stock, out of print, and so on) which are used by online retailers such as Booktopia to prioritise books more highly in search results. They may also be able to further enhance the metadata feeds with additional information fields and multimedia files. In the second part of this discussion about book distribution options we will examine the important questions you need to consider when searching for a distribution partner and identify the Top 3 Book Distribution companies for self-published authors. We will publish the second part of Richard’s post on book distributors next week. In the meantime you can follow Richard on Twitter or sign up to receive his posts on the publishing and self-publishing industries.